We’re absolutley delighted to announce that we are one of the seven UK representatives for the 2019 – 2021 International Rainbow Project. 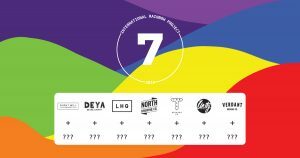 We’ll be working alongside our friends and amazing brewers from Burnt Mill, Deya, Left Handed Giant, Track, Unity and Verdant. We can’t wait to announce more details soon…..